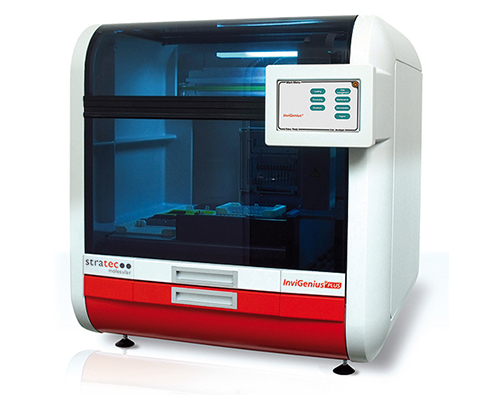 The InviGenius PLUS® simplifies laboratory workflows by using a walk-away robotic system for a magnetic bead-based isolation of nucleic acids from 12 samples in parallel. This method permits the isolated cell-free DNA (cfDNA) to be concentrated to a low elution volume of 100 µL for detection and analysis of biomarkers. With the InviMag® Free Circulating DNA Kit/IG, the instrument can automate purification of cfDNA fragments from 4 mL of plasma or serum samples. Also, a suite of products is available to quantitate the extracted cfDNA using qPCR, e.g. before use in NGS or other downstream applications, and perform bisulfite conversion on cfDNA for methylation analysis using the InviQuant GeneCount 40, InviGene Bisulfite Conversion Kit.